Journal of the Society for American Music is an international, peer-reviewed journal dealing with all aspects of American music and music in the Americas. JSAM is dedicated to supporting scholarship that transcends disciplinary boundaries, cutting across historical musicology, music theory, ethnomusicology, cultural theory, identity studies, and American studies. JSAM encourages international dialogue across disciplines. The journal features articles, reviews of books, recordings, and multimedia items, and explorations of special topics. 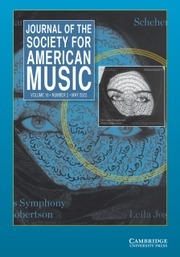 Journal of the Society for American Music welcomes papers covering cultural hierarchy; social, political, economic, gender, and sexuality issues; race and ethnicity; the impact and role of the media; sacred, secular, and popular contexts and traditions; geographical and historical patterns; composers, performers, and audiences; historiography and reception history; problems of research, analysis, criticism, and aesthetics.